Over the past fifteen years, Toro has executed agreements and implemented landfill gas to energy projects with fortune 100 companies such as General Motors, DuPont, General Electric, DaimlerChrysler, Sunoco, Marathon Refining and NASA's Goddard Space Flight Center. These projects range from firing LFG with natural gas at the assembly plants of automakers to providing LFG to NASA's Goddard Space Flight Center (this project is the first federally funded agency to utilize LFG). In 1999, Toro received the EPA's Landfill Methane Outreach PROJECT OF THE YEAR AWARD for its project with General Motors that involved delivering LFG from two landfills to a General Motors power plant that Toro converted from coal to LFG/natural gas. DaimlerChrysler received the State of Missouri's Governor Pollution Prevention Award for Toro's Project that provided LFG to DaimlerChrysler's Fenton Mo. Assembly plant. When you hear the name San Luis Obispo (SLO), Ca. some people think of the city that was named the “happiest city in the US” as well as one of the “friendliest cities in the US” by USA today. Others think of a beautiful town that sits in a picturesque valley near one of the world’s best waterfronts, which has a wine country and great places to visit such as the Hearst Castle. 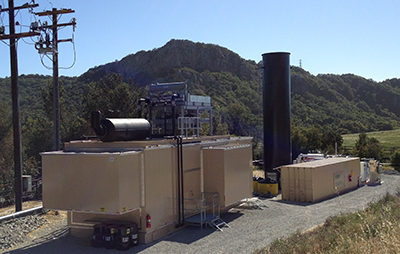 For Toro, SLO represents all the above as well as being the home of a Toro 1.5 Mw landfill gas-to-energy project. Toro contracted with Waste Connections for the gas rights and completed the project “from scratch” in 14 months after signing the contract with the Landfill operator. The gas is collected, and then sent to Toro’s cat 3520 engine and gen-set, a medium Btu customer, the flare or a combination of all three. The LFG is dehydrated if sent to the engine. Toro also installed the enclosed flare for the landfill. Advance One Development did a great job planning, designing and executing the implementation of the project on an extremely small footprint! 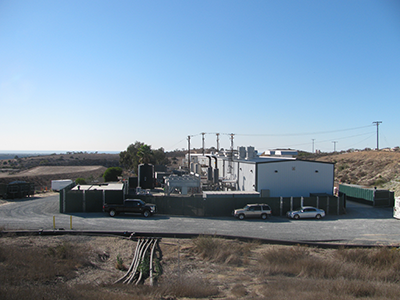 In November 2011, Toro and EPP Power Partners purchased the Otay Landfill Gas to energy project from Covanta Energy. The Otay project is located on the Otay landfill in Chula Vista, Ca. and consisted of 4 cooper-superior engines that had a potential generating capacity of approximately 7.7 MW. In addition to the generating facility the landfill was also flaring gas. After evaluating the project, Toro and EPP believed the project represented an opportunity to improve and expand a plant that had been operating for twenty years. The project has seen improvement in the existing facility through added dehydration and improved operating procedures and now gas that was being flared for years is now used to generate an additional 3 mw of power. Two cat 3520 engines and gen-sets as well as the compression facilities have now been added to the project, making the project capable of producing in excess of 10 mw. The project construction was completed by Energyneering Solutions, Inc. who completed the construction and start-up (including a new building) within three months of receiving our final approval to begin construction. Toro Energy was awarded the 1999 EPA's Landfill Methane Outreach PROJECT OF THE YEAR AWARD for its project with General Motors (GM) at the Lake Orion Assembly Plant in Lake Orion, Michigan. Landfill Gas (LFG) is transported to the GM powerhouse from not one, but two landfills that are located adjacent to the Plant. The LFG is used as fuel in a boiler that Toro converted from coal to 100% natural gas/landfill gas fired. Toro Energy installed a five-mile pipeline from the Oakridge Landfill to the DaimlerChrysler's Fenton, Missouri automotive plant's powerhouse. The LFG is delivered, after removal of H2S, to the Daimler-Chrysler powerhouse where it is used to displace natural gas as boiler fuel. The DaimlerChrysler powerhouse provides steam for two assembly plants-the mini van plant and the truck plant. This project involved a 1400' bore under a major U.S. river and won Daimler-Chrysler the State of Missouri Governor's pollution prevention award. General Electric's Appliance Park Facility is a complex of approximately 140 acres, including 5.5 million sq. ft. of manufacturing space and 600,000 sq. ft. of office space situated in Louisville, Ky. Toro Energy constructed a five-mile 12-inch pipeline from Waste Management's Outer Loop landfill through town to GE's powerhouse where all or part of the LFG is used as boiler fuel, displacing both coal and natural gas. Toro Energy installed eight miles of 8-inch HDPE pipe to transport LFG produced from a local landfill to the General Motors Fort Wayne, Indiana Truck Plant. Toro modified one boiler to burn LFG and natural gas separately or simultaneously. The Plant utilizes the LFG on a continuous basis. The Evergreen Landfill Project consists of purchasing LFG produced from the Evergreen Landfill and delivering the LFG to MSC Walbridge Coating, Inc.'s (Walbridge) Toledo Ohio facility, located adjacent to the Landfill and to the Sunoco refinery located three miles away. Walbridge uses the LFG as fuel for one or both of their two modified Cleaver Brooks boilers, and the LFG is simply blended into the Sunoco fuel gas header at the refinery. In October of 1997, Toro began delivering LFG produced from Waste Management's closed Statewide Landfill through a three-mile pipeline to the Marathon-Ashland Refinery where the LFG was delivered into the refinery's fuel drum. Toro constructed a nine-mile 600 psig high pressure pipeline to deliver LFG into a 20-inch natural gas pipeline. Before it leaves the landfill the siloxanes are removed through carbon filter beds, the H2S is removed and the gas is dehydrated to pipeline specifications. This project is a "first" in the landfill gas to energy business where medium Btu gas is delivered into a natural gas pipeline on an MMBtu adjusted basis. The landfill is the largest in a three state area. Toro delivers LFG to the NASA-Goddard Space Flight Center in Bowie, Maryland through a five-mile 10" HDPE pipeline. The LFG is used as boiler fuel in two of the Flight Center's boilers. This project is another "first" as it is first LFG project to fuel a federally funded facility. The ribbon cutting ceremony was attended by EPA Administrator Christine Todd Whitman and NASA administrator Shawn O'Keefe. Toro delivers LFG from the Waste Management Pecan Grove Landfill to DuPont's Delisle, MS. titanium oxide plant located five miles from the Landfill. Toro removes the H2S and dehydrates the LFG prior to delivering the LFG to DuPont as boiler fuel. Toro engineered and installed all boiler modifications and combustion system controls.